Once again, I’m late to the party, waving my freak flag. My favorite food and writing bloggers pump out relevant blogs several times a week–how do they do it? These days between exhausting road trips taking care of family matters (er, drama), insuring my third and final edit was returned squeaky clean (wine, please), and squeezing in basal cell skin cancer surgery ON MY FACE (thankfully the least worrisome of the skin cancers–wear sunblock, folks)– time management has been challenging. I hope your summer is off to a more relaxed and mellow cadence. But now, since I’ll continue resembling the Phantom of the Opera another week or so, I’ll be hiding indoors. So I ordered a new toy on Amazon to cheer me up. 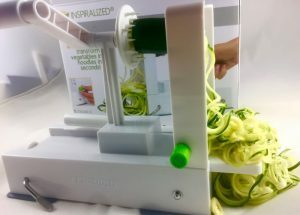 An Inspiralized spiralizer! And yes, you’ve probably been using one for years. (I mentioned I’m always late to the party, right?) I’ve been googling away at spiralizer recipes. 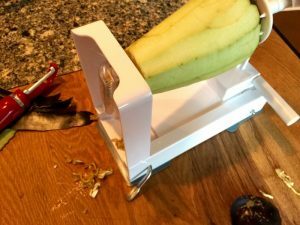 There are a lot out there–mostly, from what I’ve seen, using zucchini. Is there a reason? A quick blanch is all the “zoodles” need. 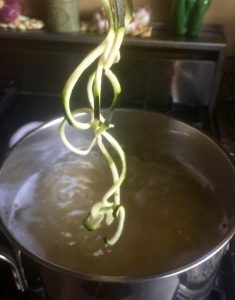 Boil desired amount of linguini or spaghetti (apx.1/2 pound) and in the last 45 seconds of cooking time, blanch the spiralized zucchini (4 medium zukes spiraled with blade C) in the boiling water along with the noodles. Drain, and season the dish with EVO, minced garlic and red pepper flakes. Serve with loads of Reggiano! Eggplant doesn’t seem a good choice for the spiralizer. Onto the eggplant–this has to be one of my favorite veggies. I was planning to sauté it, perhaps turn it into a curried vegetable dish. It would be beautiful. Even peeled, the seedy, thick flesh refused to go through the feeding tube, as if to tell me love me as I am. Sweet potatoes, beets and butternut squash (as long as the food blogs don’t lie) seem to be viable candidates for the spiralizer. Lord knows, I don’t need another toy used once a year demanding 10-inches of shelf space. Another thing to cheer me up is the WONDERFUL job the team at Lake Union Publishing did with my book cover. I received the final version and it’s magnificent. I couldn’t be happier! 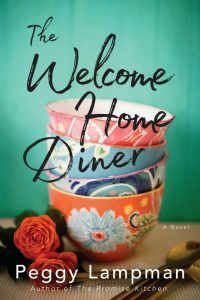 For those of you who are new to my blog–I write women’s fiction focusing on my passion–– exploring food as a means for breaking down familial, as well as, cultural barriers. Have a lovely Monday! Good eatin’, good readin’, good lovin’! 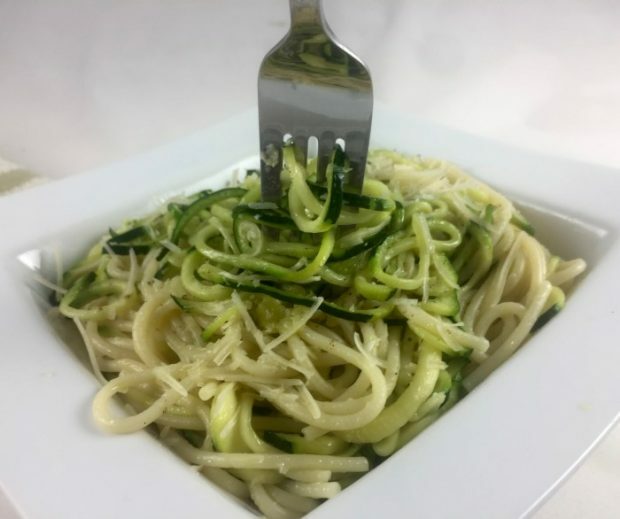 4 Responses to Oodles of zoodles to channel the words! Great looking cover! I will submit my order now! I probably won’t tell my husband about the spiralizer or he’d have one here by tomorrow, taking up precious cabinet space . . .
Oh, thank you, Debbie! I look forward to your feedback. And DON’T tell the hubby–esp. if you need to save the space for staples–wine comes to mind! Peggy, I’m so excited for you regarding the release of The Welcome Home Diner. How can I contact you directly? I would love it if you would be able to write me a line or two about the copyediting I did for you on both books. Cheers and all my best! Paul! You did such an AMAZING job with both THE PROMISE KITCHEN and THE WELCOME HOME DINER. It was my absolute honor to thank you in the acknowledgements. My e-mail is peggylampman@me.com, comments in my in-box from all readers are welcome!